Freja - a rising star! We are finally in Arviat! We arrived last night after a very long day. At lunch, we figured that it was only 14 more miles to the village so we decided to push on. After 9 hours of travel, (compared to our normal six hours that we and the dogs were accustomed to) we covered more than 30 miles. The dogs were simply incredible. It was largely due to the efforts of Freja - a rising star of the team as a lead dog. She was in lead almost all day and just kept going. Freja is only two years old, so she is really still a "puppy." Our Polar Huskies grow until they are three years old, so we often consider them puppies until then. Freja is very mature for her age and just loves to work. She has one small quirk and in order for her to be at her best she prefers working with men?!? It really isn't that odd because she is a favorite of our dog trainer Jens, who loved her from the day she was born, always giving her a little bit of extra attention. He put a lot of time and heart into her training. Jens would have been so proud yesterday. We felt like proud parents, too! We have traveled almost a hundred miles in the last three days - more than what we have covered in the past seven days! One of the reasons is because we have recently had excellent conditions. With very little or no wind, we have traveled on a good solid snowpack following a bombadier trail Aksel found. Bombadiers are the "Trucks of the North." A couple of hours later we even found the bombadier which had broken down in the storm we had experienced two days before. Obviously, there is no road leading from Churchill to Arviat. However, that doesn't mean that there are no truckers. "Brett," whom we met on the trail, drives a very funky looking vehicle which looks like an overgrown Volkswagen Bug with a rounded front, plated sites, big tracks, and a huge ski in front used to steer. The bombadier is named after its inventor, Joseph-Armand Bombadier, who built the first one back in 1934 when he was only 27 years old. He had actually been contemplating building an all-terrain vehicle that could operate on snow since he was a teenager. At the ripe old age of 15, he constructed his first "snowmobile" using an old sleigh, a propeller, and the motor from a Ford Model T. In 1959, thirty seven years later, Mr. Bombadier also built the first snowmobile as we know them today, calling it "Ski Dog." The name eventually changed to "Skidoo," probably because it sounds better! Brett's Bombadier broke down many times before he eventually had to leave the car on the ice in order to be able to reach Arviat. The bombadier we met was hauling a car to Arviat. We were happy to see it because of the nice trail it was making for our dogs to follow. The first day we kind of played tag with it as it kept breaking down. Brett would pass us, travel for a while, and break down. Then, we would pass the bombadier for a couple of miles. A little while later it would come flying by and eventually break down again...and on it went. Finally, the problem was fixed properly and it disappeared in the horizon. It was nice to finally have some fairly easy travels. The weather and difficult traveling conditions have been frustrating and we were even further delayed after our last report because of a BIG and kind of crazy chase. It was a beautiful clear day, perfect for making up lost time. Paul was out in front with Cola in the lead, when he saw four caribou on the horizon. Knowing this could mean potential trouble, Paul stopped his team, set his snow hook (a type of brake), and stepped back to tell Mille to be wary of the animals up ahead. He said, "So, hang on to your team." With the last few words still leaving his mouth, the snow hook was snapped free (making a loud "ping" sound) by his lunging team and off the dogs ran at full speed after the caribou. Paul was only five feet behind his sled and they accelerated quickly leaving him "in the dust" so to speak. Once Cola had seen the caribou, the chase had begun. Aksel and the other dogs on the second team, never even saw the caribou, didn't get a burst of energy like Cola, and consequently, couldn't even remotely keep up with the first team. They were quite a sight to see loping away from us at full speed. Now, it would have been one thing had they all run in the correct direction - north - that we were currently traveling. Instead, the whole cruising caravan went due west. We couldn't keep up. Our progress seemed more like snails as we yelled and called fruitlessly into the wind. It was a very scary situation. We were exhausted. What if we couldn't catch them? Half of our supplies are on that sled; the dogs could get seriously hurt. There were a million potential disasters running through our minds. At the same time, the situation was also kind of funny. We were hoping for the caribou to just take off, run away, and out distance the dogs. The dogs then might give up and we would be able to catch them. The caribou didn't seem to be sharing our same plan. They kept stopping and running in circles right in front of the team. This just made the dogs more excited so they would sprint and try to catch up to caribou again. At one point, the caribou even ran straight at the dogs!! After over an hour of this crazy chase, Cola finally made a big circle and turned towards Paul. He was drenched in sweat and was almost brought to his knees by the physical exertion of the whole chase. Needless to say, it was a fairly unnecessary detour. We then spent an extra day or two getting back to the coast as we got caught in rocky tundra without any snowcover. We are definitely ready for a break! Caribou are a cousin to the reindeer. In Nunavut, caribou are known as "Tuktu". Nunavut contains three subspecies of caribou. On the most southern Island of Nunavut, the Belcher Islands in eastern Hudson Bay, lives the first subspecies, which is actually a Reindeer (just like the ones Santa Claus uses). They were imported from Siberia in 1978 because the native caribou had disappeared about 100 years earlier. Unfortunately, that might be the fate of the second subspecies: the Peary caribou. They live on Queen Elizabeth Island. Peary caribou are recognized as an endangered species in Canada. They are about half the size of the ones we were chasing and are naturally rare because of the sparse vegetation in the high arctic. Their food is usually buried beneath snow and ice for up to 10 months out of the year; therefore, the land can not support a high density of animals. Most common are the Barren-ground caribou which live here on "the main land." Their range spans all the way to the southern arctic islands and out to the west coast of Alaska. They live in huge herds, one of the largest roams in the area between here and Baker Lake. The Qamanirjuaq herd as it is called has been estimated to contain around 496,000 individuals. Another large herd is called the porcupine herd which migrate incredible distances. Each season they travel across the tundra of Canada out to the coast of Alaska where they calve (have babies). They also graze constantly in order to store energy and fat for the long upcoming winter. Luckily for the caribou, this area also happens to be a national preserve. The government of the United States is considering opening the area for crude oil drilling. It is a very controversial issue and happened to be a key discussion in the recent presidential election. Drilling in this area could threaten a very fragile biome which does not "bounce back" or heal itself as quickly as in some other regions. For example, tire tracks on the tundra can still be seen 30 years later! Many native Americans are also concerned. On one side, there is a culture who depends on the caribou as a means of subsistence. Drilling could potentially alter how these people survive. On the other side, a group of natives who live by the coast and are less dependent on the caribou, feel differently. They see the economic benefits associated with a drilling operation: jobs and a new source of income. It wouldn't be a controversial issue if everyone agreed, now would it! There are two sides to every coin. In this situation, there are even more variables that will affect people's decisions. What's your opinion on this current issue? Visit the collaboration zone A World of Resources to see what other students think and discuss this important topic further. The caribou have always been the most important land mammal to the Inuit. Traditionally, the lives of Inuit were closely tied to these great "wanderers". In times of scarcity, the Inuit not only risked starvation, but faced winters of perpetual cold without the unsurpassed insulation of caribou-skin clothing. Caribou hair is hollow (like many other arctic animals) making it extremely warm (try and figure that one out, you might find some hints here) at the same time it is lightweight and very durable. A hunter's caribou clothing only needs to be replaced every few years, when it starts loosing its loft - basically it's warmth. Now, if you have read about what we wear in "long johns" in Polar Husky A to Z, you know all about what we wear and that it does not involve caribou skin. With it being so warm, you probably ask "Why not?" The answer: It is too warm!!! Our tent is not a suite at the Hilton, but it is our home. Each night all of our clothes are hung up to dry. Considering the conditions we are in out here, you might think we are pretending to be very tough with such a statement or just plain nuts. Actually, it has more to do with the way we travel. When the Inuit hunters travel out onto the sea ice to find a breathing hole of a seal, their sleds are almost empty. 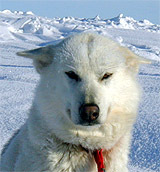 A hunter will sit on the front end of the sled where the team can easily be steered and guided. Once at the breathing hole, a hunter might sit completely still on the ice for several hours. Imagine ice fishing, but without a heated ice house! We on the other hand are very active: skiing for hours on end, harnessing dogs, lashing sleds, chopping away at pressure ice. We are moving and traveling all day. That means our worst enemy is overheating!? Out here, sweating isn't just a nuisance. Being wet from sweat could prove deadly. There is a quick answer to the dilemma though: layers. Layering our clothing allows us to easily regulate our body temperature. Technically, we are constantly trying to achieve an equilibrium between our body's metabolism, our particular activity, and weather conditions. The combination of layers changes on a daily and hourly basis. Both of our metabolisms are very active out here and we burn calories at a fairly high rate. Not nearly as high as one of an earlier team mates Victor Boyarsky from Russia. He is like a burning woodstove, no matter the temperature he is always warm. He even took a "snowshower" every morning! His body requires more food, but it gives out a high amount of energy which keeps him warm. You might think that would be optimal to be "burning" like that out here. But actually not necessarily, since that also means he very easily sweats a lot, making his clothing soaked with sweat. That can be dangerous in a situation where he is not moving. And it also takes a long time to dry out the clothing at night. Sweating less, means not wasting extra energy, and therefore, saving strength and food. 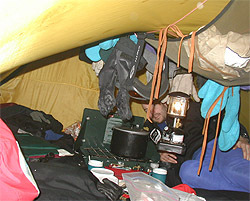 It also means not wasting extra fuel to heat the tent and dry clothes allowing us to go to sleep earlier and catch up on our beauty sleep. (Drying out our clothes and making water are our two biggest jobs each night.) It is amazing how we become almost obsessed with our clothing out here - keeping it dry and in good condition. Think about that for a second. What role does clothing play in your life? Visit the collaboration zone My Arctic Engine to see what other students think and discuss this important topic further. The stone structure on the right of the picture is an Inukshuk and is our first sign of Arviat. It is a welcoming Inukshuk. We are spending today taking a rest day in Arviat. Tonight we are invited to stay with Peter - an elder Inuk. Perhaps he will show us more about their traditional clothing. More trail news at the end of the week! Thank you for all the kind messages and good questions!